Many gardeners are concerned about dogs and lawns and dogs doing damage to other plants. While it’s true that dog urine can be damaging to grass, as well as shrubs and perennials, there’s a lot of mythology on this topic, according to Cheryl S. Smith, author of Dog Friendly Gardens – Garden Friendly Dogs (Dogwise Publishing, 2004). Smith points out there’s no truth to the belief that female dog urine causes more damage to lawns because it’s more caustic. Female dogs get blamed for spots in the lawn more often, because they tend to empty their bladders in one go on the lawn, whereas males like to spread it around and pee on things other than the grass. 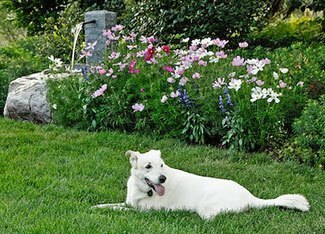 The damage done by dog urine on lawns and other ornamental plants is caused by excess nitrogen in one spot, and that “burns” plants. If you could spray water consistently every time wherever there is dog urine on the grass, the problem would go away, and the diluted nitrogen would actually green up your lawn. Changing a dog’s diet by adding tomato juice or salt, or even putting baking soda into drinking water, won’t solve the problem and won’t benefit your lawn. Excess salt is just as bad for our canine friends as it is for us. In fact, such “remedies” may increase your dog’s risk of bladder disease and other serious health problems. You can avoid spots on the lawn and burning of plants by training your dog to go potty in a particular part of the yard. Choose a spot away from your favorite outdoor living spot. It isn’t much harder to train than it is to housetrain in the first place. Like all training, it requires time, patience and persistence early on. It is more likely to be successful if you do the training when you first get your dog or puppy, and you’re going to be with him or her full time for at least a week or more. I’ve done this successfully with my own dog, Toby,(above). Now, whenever he starts to lift his leg where I don’t want him to, I say “not there” and move quickly towards the designated spot, and 99 percent of the time he gets it. To avoid problems, I always make sure he goes straight to the peeing area whenever we go outside. After he goes, he’s allowed to play on the lawn and hang around the plants I want to protect. When it’s time for a bathroom break, take the dog to the yard on a lead. Go straight to the designated spot, and use a phrase such as “go pee” or “do your business.” If your dog is successful, praise lavishly and give a food treat, play break or walk as a reward. If the dog doesn’t eliminate within a couple of minutes, take him or her back indoors and confine for 20 minutes to half an hour, and then try again. After a week or two, try it off-leash. If you’ve been successful, you dog will head right for the correct spot. If not, continue to work with the lead. Your dog might backslide, so be prepared to go outside with him or her until the habit is fully established. However, if your dog slips up, don’t punish or make a big deal of it. Just dilute the urine with a watering can or the hose. Then try the lead again for a few more times until your pet gets it. Try creating a special potty area with wood chips, or pea gravel as a surface, and screen it from view with a trellis fence or informal grouping of shrubs. Dogs tend to want to do their toilet on an absorbent surface. Male dogs respond well to a “lift-your-leg” post in the ground, which helps prevent damage to shrubs and young trees. When it comes to dogs and lawns, clean up often. Remove poop and run a sprinkler occasionally to wash away odors and dog urine on lawns. A dog will start avoiding the toilet area if it’s filthy. As for gardeners, there’s nothing worse than having to clean up a winter’s worth of dog droppings in early spring. Put dog feces in the garbage, or flush down the toilet. Don’t add to your compost pile, as it could contain worm eggs or other hazards. Have your dog’s stools checked for worms when you see your vet.